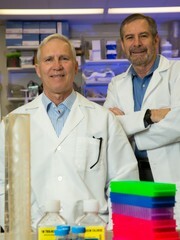 John T. Schiller, Ph.D. (left) is Deputy Chief of the Laboratory of Cellular Oncology at the National Cancer Institute's Center for Cancer Research. Douglas R. Lowy, M.D. (right) is Acting Director of the National Cancer Institute (NCI). Dr. Lowy is also Chief, Laboratory of Cellular Oncology, NCI Center for Cancer Research. Dr. Schiller and Dr. Lowy led the initial development and characterization of the human papillomavirus (HPV) prophylactic vaccines now used to help prevent HPV infections associated with cervical cancer and other diseases.